A prototype helicopter is currently undergoing flight trials by the Piaggio company. Styled P.D.4, it is a tandem-rotor design, powered, apparently, by an inverted-vee, eight-cylinder engine at the rear. There appears to be a large space behind the pilot's seat where cargo could be stowed in the vicinity of the e.g. 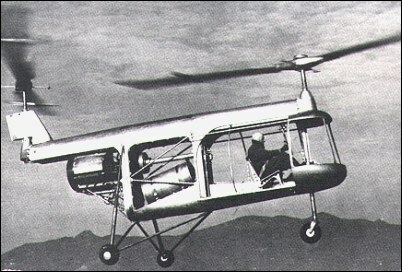 The P.D.4 was a four-seat helicopter with two rotors placed in tandem. Initially it had to be equipped with 450hp Alpha Romeo engine but then a 215hp Franklin was adopted. Has anyone, any more info on this helo??? I have recently visited several helo museums in Italy and do not recall seeing the PD4, however Italy has a very rich aviation history and contacting perhaps someone at ENAC or Agusta or perhaps one of the many Italian aviation magazines may help.